Smuggled and Smuggled-2 ..Read Aust's corruption bestsellers! 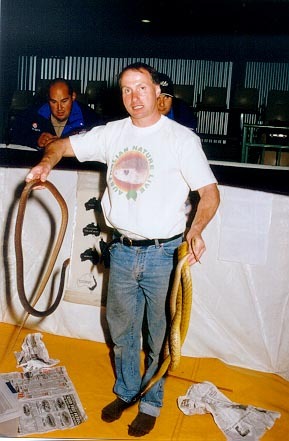 Freehandling Venomous Snakes - NONE ARE VENOMOID! Note: The three photos below may be downloaded and reproduced as High Quality High Resolution jpegs by clicking on the images themselves, and these are suitable for republication, so long as the photo source (http://www.smuggled.com) is cited. Oxyuranus scutellatus. to the left and Inland Taipan Oxyuranus microlepidotus to the right. 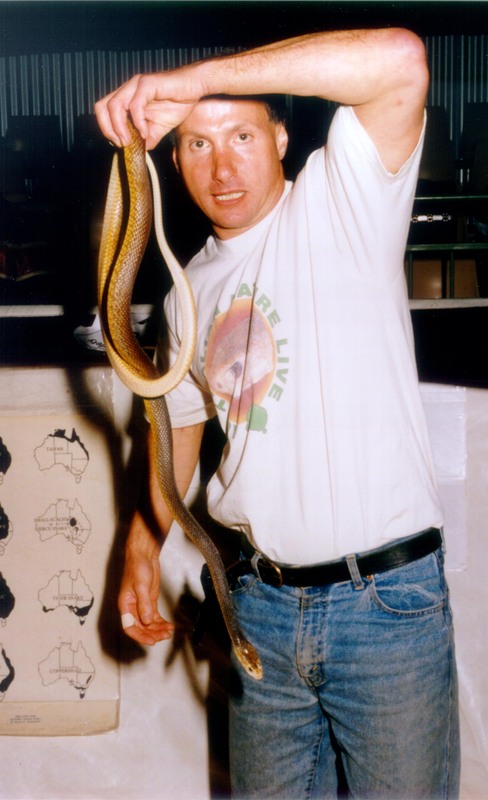 Taipan Taxonomy - including a new subspecies. 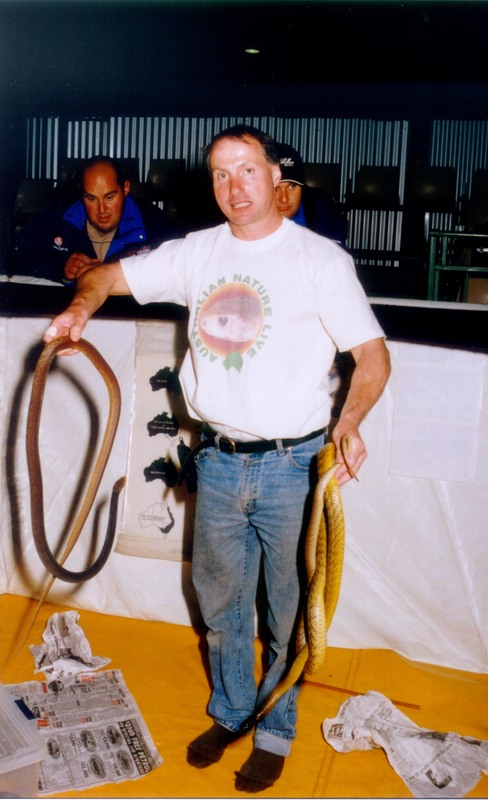 More photos of Raymond Hoser "free handling" highly venomous snakes, including other species (but not as high resolution downloads). Back to other (general photos) of Raymond Hoser. Been raided lately? 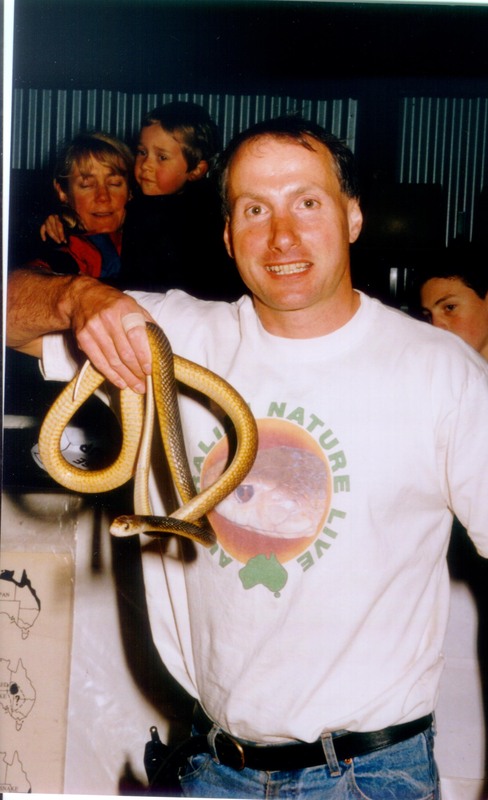 : Fisheries / NPWS seizing reptiles. ... Smuggled / Smuggled-2 .... available now. "herp.com.au" Australian herp information sites SCIENTIFIC PAPERS ON REPTILES SNAKES Blind Snakes Green Pythons Black-headed Pythons Womas Children's Pythons Stimson's Pythons Spotted Pythons Ant-hill Pythons Oenpelli Pythons Scrub (Amethystine) Pythons Water Pythons Olive Pythons Carpet Pythons (all forms) Rough-scaled Pythons New Kinds of Pythons Tree Snakes Death Adders (Southern) Death Adders (Barkly T.) Death Adders (A. cummingi) Death Adders (Desert) Death Adders (New Guinea) Death Adders (A. barnetti) Death Adders (A. l. bottomi) Death Adders (A. crotalusei) Death Adders (A. wellsei) Death Adders (A. woolfi) Copperheads (Lowland) Copperheads (Highland) Pygmy Copperheads Eastern Brown Snakes Little-Whip Snakes Golden Crowned Snakes Krefft's Dwarf Snakes Pale-headed Snakes Broad-headed Snake Stephen's Banded Snakes Tiger Snakes Red-naped Snakes White-lipped Snakes Marsh (Swamp) snakes Black snakes King Brown snakes False King Brown snakes Curl Snakes Small-eyed Snakes Master's Snakes Sea Snakes Not in this list - search this site LIZARDS, ETC Lace Monitors (goannas) Bluetongue Lizards Bearded Dragons Legless Lizards Frogs - dying out? 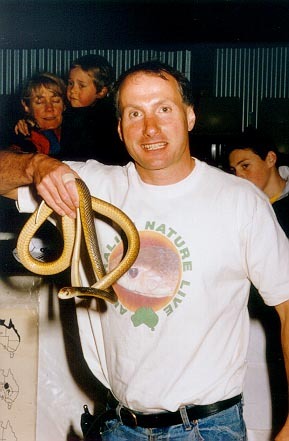 HERPETOLOGISTS - PHOTOS OF THEM GROUND-BREAKING BOOKS Endangered Animals of Australia Australian Reptiles and Frogs Smuggled Smuggled-2 The Hoser Files Victoria Police Corruption Victoria Police Corruption - 2 Corruption books CD-ROM Reviews - click on linked text Search the full texts of these books BANNED CORRUPTION WEBSITES Victorian Police Corruption Dynamiting the cone of silence Wildlife Trafficking Internet Censorship 1 Internet Censorship 2 Internet Censorship 3 Media suppression / Police Corruption UK Police Corruption Tortoise massacre Scientific Fraud Corruption Book Seizure Unlawful Wildlife Seizures Corruption book give-away Police whistleblower jailed! Heroin Importation by NCA et. al NSW Police Corruption Murder - cover-up Are your kids safe? Pedophiles West Australian Police Corruption Corruption documents in NSW Parliament Diary of a corruption whistleblower Media Lies 1 Media lies 2 Another bent copper More corruption sites Not sure? - Use this site's search engine Search for a bent policeman, official, etc. 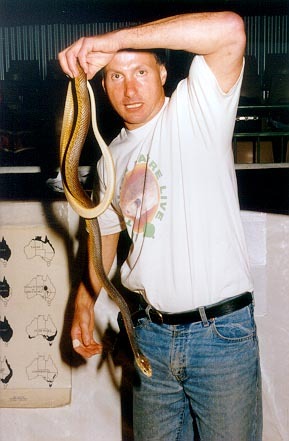 Back to the list of herpetologist's photos.